His interviewer, a late-night TV talk show host, believes Chance is speaking figuratively; the audience does as well, both those in the studio and millions more across the country. They all take him for a brilliant man who advises the president on economic policy. Chance is just an agreeable, gentle and kind man of limited mental capacity who happens to be in the right places at the right times. Within days of mistakenly being invited into a privileged conversation with the president, and making his “figurative” statement on national television, leaders of a major political party are seriously considering him as a candidate for the next president of the United States. All Chance wants to do is watch television. Kind of like the guy in the White House right now. 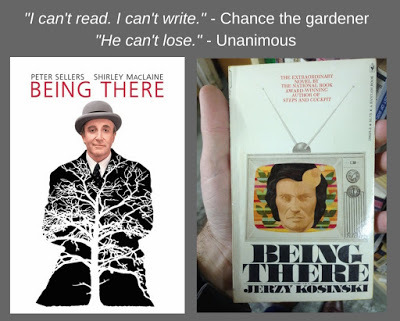 Chance is the main character in Jerzy Kosinski’s 1970 novel, “Being There,” and the 1979 film of the same name starring Peter Sellers as Chance and Shirley MacLaine as EE. She is the trophy wife of Benjamin Rand, icon of the international business community, economic adviser to the president and an old man who is close to death. Chance has been the gardener in the house he has lived in, and has never left, since the day he was born. The home and garden belong to “The Old Man” (not to be confused with the dying Ben Rand). Chance knows nothing beyond his garden, what he sees on TV, The Old Man who he seldom sees, and Louise, the maid who brings him his meals every day. Anything beyond that makes him uneasy. Following The Old Man’s death in the first few pages, Chance bumbles his way from the house to the street, where he gets pinned between a car and EE’s limousine; from finding himself the Rands’ houseguest to becoming EE’s amorous obsession; from watching TV in his guestroom to participating in the previously mentioned privileged conversation. When EE first meets him, she asks his name. 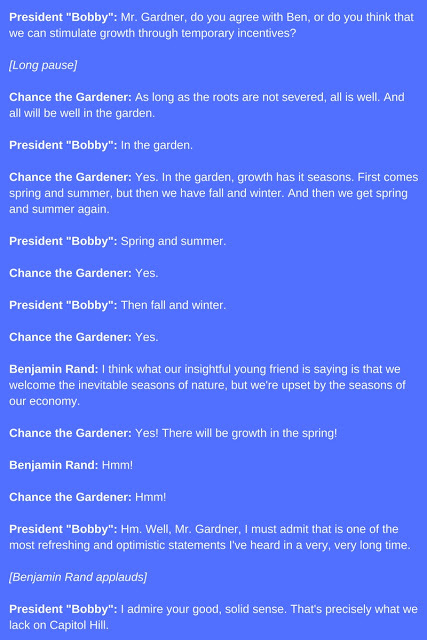 “I am Chance, the gardener,” he says. She hears “I am Chauncey Gardiner.” And that’s who everyone thinks he is for the duration: Chauncey Gardiner, economic genius, business mogul and presidential confidant. Hilarity – of course – ensues. Kosinsky sets up plausible situations and contexts that lead to capitol domes full of misunderstanding, misperception and missed kisses from EE. That scene is particularly gut-busting. There sits Chance, peeking from between EE’s arms and around her head, completely oblivious as she nibbles at his earlobes, desperately trying to see the TV across the room. She lays herself bare, proclaims her undying love for Chance, even though her husband lies dying in a room upstairs. As for Chance, well, the only action he’s interested is on the small screen. As I read the novel again recently, I was struck by the similarities between the absurdity of “Being There” and the story unfolding around our own sitting president. Similarities in stark, and dark, contrasts. Chance cares for the earth, trees, shrubs and flowers; President 45 is destroying decades of progress on clean air, safe water, endangered species, marginalized ecosystems and, overall, a livable planet. Chance speaks only what he knows; 45 tweets and talks about unsubstantiated wiretapping and the horrors of a terrorist attack in Sweden that never happened. Chance is oblivious to the advances of a woman; 45 brags about where he grabs women. Chance is kind; 45 is spearheading efforts to take health insurance away from people who need it most; defund Planned Parenthood, which provides health care for millions of women; and drive wedges between people of different religions, races and sexual orientations. Chance charms diplomats; 45 yells at them and threatens their countries’ security, economic or otherwise. Chance always keeps his cool; 45 launches tweetstorms unbefitting an honest man, let alone the leader of the free world. Finally, Chance is the cause of hilarity; 45 is the cause of deep divides and high anxiety around the world for the future of all people. No. There is simply no chance 45 will ever measure up to Chance. And that should make us all uneasy. “Being There” is beautifully written, with simple, straightforward language and situations that’ll make you chuckle. The film is one of those rare instances, at least for me, where the movie is even better than the book. It’s fall-down, laugh-out-loud if you have a dry sense of humor like my own. Check them out. They’re time well spent. Previous Previous post: Who is Behind “North Dakotans for Comprehensive Energy Solutions”?